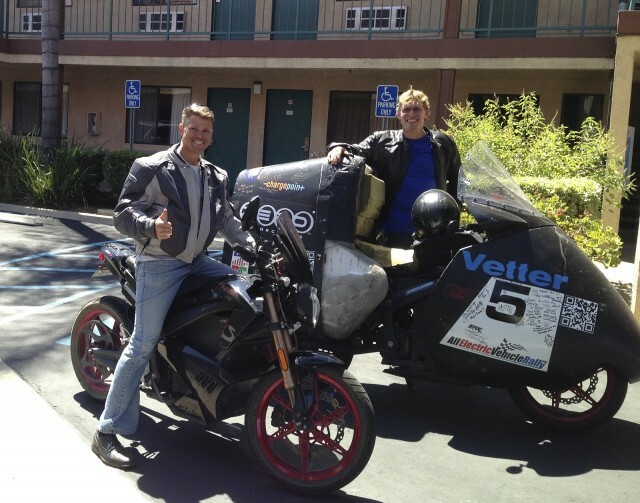 Last summer, I rode my 2012 Zero S electric motorcycle across the United States as part of the "Ride the Future" Tour. Now, as a record of that journey, a documentary we made--called Kick Gas--is being released today, on Earth Day 2014. Our little caravan of electric vehicles traveled 4,000 miles in 44 days, comprised of a Nissan Leaf electric car, my Zero S electric motorcycle, a Xenon electric scooter, and an A2B Alva electric bicycle. The goals of the trip were to set Guinness World Records for longest trip in an electric car, motorcycle, scooter, and bicycle--and also to spread the word about electric vehicles. We traveled from Charleston, South Carolina, to Google Headquarters in Mountain View, California. What follows is the real backstage account of a groundbreaking electric-vehicle parade across the entire country. Charging the vehicles was always a fundamental concern, and we had two different flavors of vehicle on the tour. The batteries for the Nissan Leaf and Zero S are built into the vehicles; both can be charged using 240-Volt Level 2 charging stations. The bicycle and scooters have removable batteries that can be charged at any outlet. We traveled about 100 miles each day--sometimes more, sometimes less--which means the Leaf and Zero S would often need to charge halfway through the day. East of the Mississippi, we found charging stations without much trouble, so there was little concern as we traveled through South Carolina, Georgia, and Tennessee. Once we crossed the Mighty Mississippi, however, we found we had to get creative with charging. Fortunately we carried adapters that proved very helpful. Aerovironment gave us a charging cord to test that let us charge every night using the 240-Volt air-conditioner outlet at our motels, and during the day using 50-Amp connections at RV parks. Throughout the Midwest, the Nissan Leaf would charge at RV parks, while I could charge the Zero motorcycle in the back of restaurants as we ate, using a 120-Volt outlet. The most fun way to charge was bringing my motorcycle into my hotel room! Perhaps one time in four, the person at the front desk would suggest that I bring my motorcycle into my room to charge since they did not know about any external outlets. And with no gasoline or oil, the electric motorcycle wasn't a safety hazard inside the room either. The bicycle and scooters would each go through four to eight batteries a day, and we had four chargers that took about 3 hours apiece for a full charge. Initially, a couple of the scooter riders had to wake up twice each night to get enough batteries ready for the next day--but eventually we settled into a schedule that let us charge in the evening before going to bed. Taking a road trip on a two-wheeled vehicle is incredible, in part because you see and experience the country in a unique way. But while it was awesome to see the Grand Canyon--and Las Vegas, Terrapin Brewery, Big Bear, the Pacific Coastal Highway, Newport Beach and a host of other places--it was the people we met who gave our journey the most meaning. We met electric-car drivers in towns and cities across the country, all of them supportive, who shared their stories of encouraging their towns to use more electric vehicles. We met Angel Delgadillo, who helped resurrect Route 66. 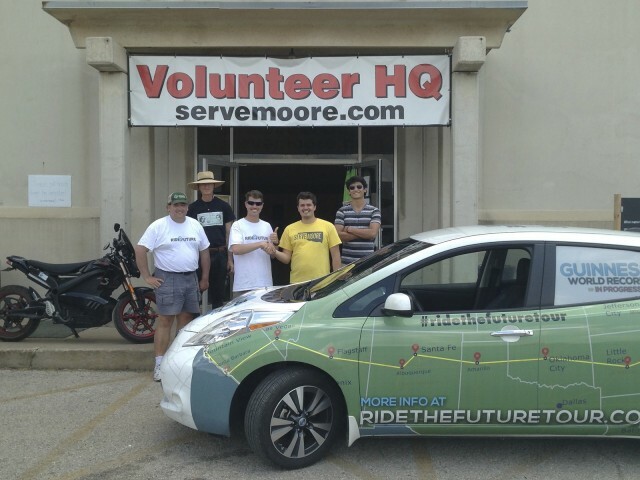 We met the good folks at Serve Moore who lent us a wheelbarrow to help clean up the tornado-ravaged town of Moore, Oklahoma. And we met hundreds of people who had never seen an electric vehicle before--and we gave them a look at what the future holds. One of the highlights of my ride was meeting up with a guy named Gavin in Albuquerque, New Mexico. We had found each other on electric-motorcycle discussion boards, and he led me to my favorite ride of the trip: a blistering fast ride up and down Sandia Mountain! Gavin rides a Brammo Empulse, and we had a great time racing up and down the mountain while following the film crew--who had to push their minivan to the limit just to keep us in sight. 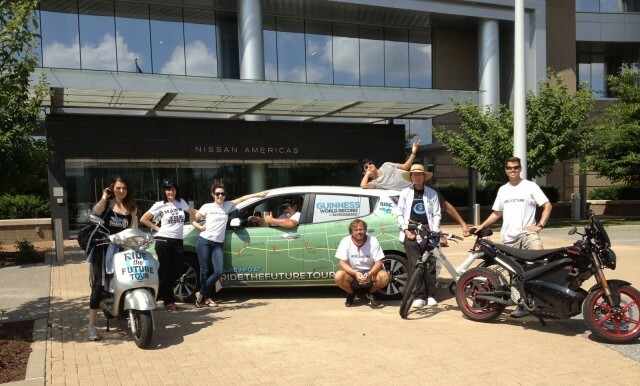 Members of the "Ride the Future" Tour met each other just four days before embarking on the journey. On July 1st, we all got together in Charleston, South Carolina--and we headed out on July 4th. It might be considered a social experiment, going on a trip for a month and a half with people you have never met before. The riders and drivers attempting the records included Susan Jones, who organized the trip, on the scooter; Duane Leffel in the Nissan Leaf; Ben Hopkins on the electric bicycle; and me on the electric motorcycle. We all brought a few friends to help keep us going, including Sean Scott, Rachel McCarthy, and Dominique Arciero. Sean's dad, Stuart, also joined us for part of the trip. The Kick Gas film crew included director Jonathan Becker, cinematographer Evan Scott, and sound man George Wymenga. 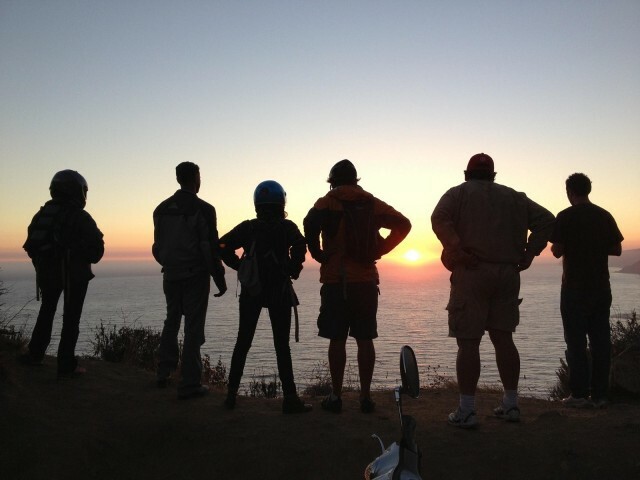 Altogether, we were 10 people--and we had quite a journey together figuring out how to keep all the vehicles charged, along with filming a movie, braving the elements, spreading the word about how amazing it is to drive an electric vehicle, and occasionally finding time to relax. The resiliency and motivation to keep moving forward day after day was incredible, and everyone added to the group effort. 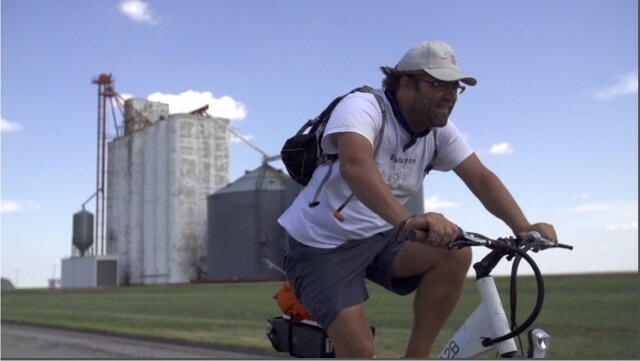 The main challenge of the journey was simply that while the motorcycle and car have the ability to travel on highways, the scooter and bicycle travel at less than 30 mph. If you want to take a trip like this, try to make sure all the vehicles can stay together. Many days, Ben Hopkins would start his journey on the electric bicycle and I wouldn't see him until I met him and Duane for lunch. However, that meant that for much of the day, we were all traveling separately or in groups of two or three instead of in one big caravan. Keeping track of everyone given limited cellular service proved to be a big challenge. For much of the journey, only a couple of us had cell service, making the Wild West seem all the more challenging. We had planned to meet media for interviews or meet local electric-car drivers in each city, but not being able to communicate quickly and easily proved frustrating. Some of our best memories came from the nights in which we camped out--although camping with a parade of electric vehicles made charging all the batteries even more difficult. We generally camped at sites that had RV outlets, which worked out well. One night, near the Grand Canyon, we camped outside of town while our batteries charged up in a hotel room nearby! Those are just a few of the exciting stories--we caught a 50-pound catfish by the mouth; stood on a corner in Winslow, Arizona (Eagles fans will recognize that one); had a variety of brushes with The Law; ran into Terry Hershner, who ended up joining us to ride for the last week; and met Paul Scott, founder of Plug-In America--and there are many more to be told. To see the trailer or download the movie, go to Kick Gas, and for more information on the movie, see the Facebook page for Kick Gas.